If you’re on location with the RED, it’s a good idea to have a Digital Imaging Technician Station (or DIT Station) which will allow you to backup up all the footage you are shooting while you are in the field, and will also allow you to view the footage and make sure it’s all good before you leave the field. If you’ve got an unlimited budget, I’d recommend the top of the line MacBook Pro (which can easily run $3,000-$4,000+ depending on how you deck it out) as well as a few external drives. 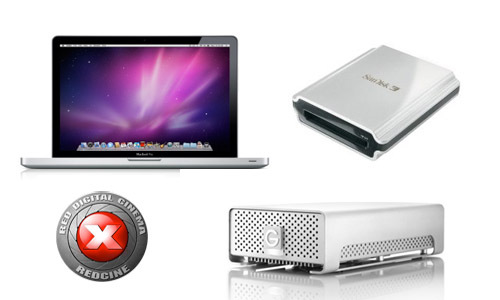 Look at the G-Technology offerings, as they have various solutions depending on your budget and needs. The G-Raid mini is a nice, small, bus-powered drive with a quad interface (FW400, FW800, USB2, eSata.) Get a few of these. You could go with the 1TB, but the 500GB might be fine. You want your data in two places, and not “RAID two places” but “two different physical drives” places. The RED Drive holds 320GB, so if you are dumping a full RED Drive, you could just dump it to a 500GB drive (well, two drives) and mark it as “DONE” and move on. 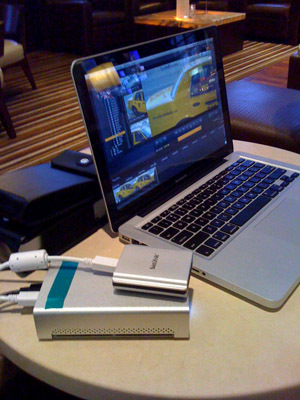 Oh, and since we have gobs of money, pick up an ExpressCard with eSata on it to put in your new MacBook Pro. For the “dumping” of data, you can either use something like R3D Data Manager which does all sorts of checksums for the data, can backup to multiple locations at once, and has other nice features, or you can do a standard Finder copy. R3D Data Manager is $79, which is not too bad… again, what is your footage worth? If you want to fly in the Finder, and can review everything you dump, that can work too. Speaking of software, RED has provided a number of excellent tools for free. Grab REDCINE-X, RED ALERT! and whatever else you may need at RED’s support site. REDCINE-X is a nice little app for checking the footage you just shot. If you are shooting to CF Cards, do yourself a favor and get a Sandisk Extreme FireWire Reader (about $65) which will dramatically speed up transferring of footage compared to a cheap USB Card Reader. (The low end MacBook Pro has just one Firewire port, but you can plug the Firewire CF Card Reader into the the back of the G-Raid mini, which has two ports. So we’ve go the MacBook Pro, which is $1,300 before adding AppleCare (but here’s a tip, you can get a refurb, plus AppleCare for it, for about $1,295) add in two G-Raid minis (the 500GB) at about $450, and a CF Card Reader for $65. We come in under $2,000 for this set up, which is not the ULTIMATE portable RED DIT Station, but it’s a Low Cost one, that is effective enough to get the job done. Posted on Thursday, January 21st, 2010 at 2:23 pm. Subscribe to the comments feed. Both comments and pings are currently closed. Post on your own blog. Your readers should be aware that the FW800 method with bus powered drives has one big “Gotcha” That is, the RED drive hogs all the power by itself and there is power left for the additional daisy chained drives. If your experience is different I’d like to know. Because, personally I haven’t tried it in a long time (I now use eSATA and a custom battery powered rig instead of FW for my “destination” drives) and things might have changed since then. Also, the SanDisk CF reader does not have a loop through. The Lexar version does. Thanks for the note DIT! The G-Raid mini also has an external power adapter, so as long as there’s juice around, the power adapter will work if you’ve got the RED Drive connected. A lot of our shooting is on location with CF cards, so doing it bus-powered works fine for that. It is just amazing being able to do a one-light grade on moving pictures – and all that on a late 2008 15? MacBook Pro.